Only one pot is needed for this low carb dinner. Have you ever made zoodles (aka zucchini noodles)? 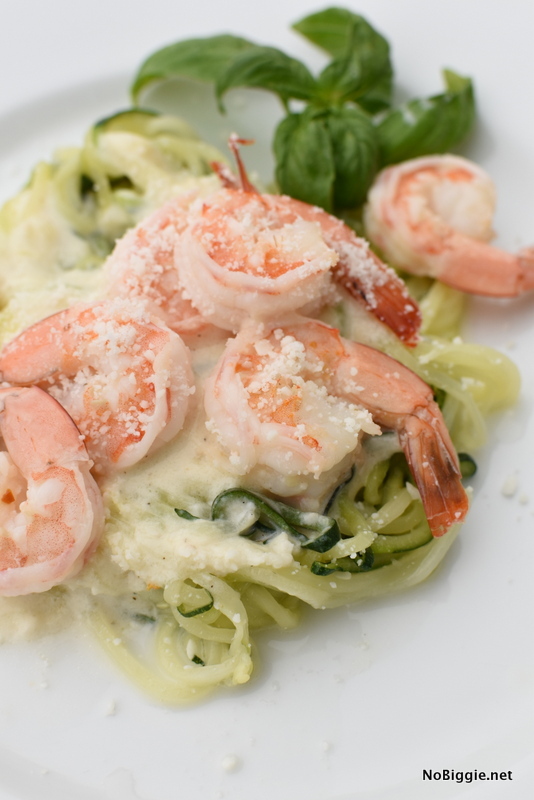 Not only are they are so fun to make, but once you cover them in creamy alfredo and top them with delicious sauteed garlic shrimp, you won’t even miss the high carb pasta you’re used to. 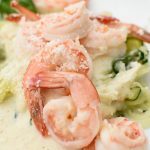 If you’re in the mood for comfort food, you have to make this one pot creamy shrimp with zucchini noodles, it’s heavenly. We only have one zucchini plant and we seriously can’t keep up! It’s crazy how much one plant produces. We’ve had a few get so big that I don’t even know what to do with them. I now know that you need to pick it before it gets too big (thanks mom). We’ve been giving the big giant zucchini to our neighbors to feed their chickens. With the rest of the zucchini, this list of zucchini recipes has really come in handy, also we’ve loved our vegetable spiralizer to make ZOODLES! We did our research when it comes to veggie spiralizers, and this Paderno Veggie Spiralizer got the best reviews. We have loved it! 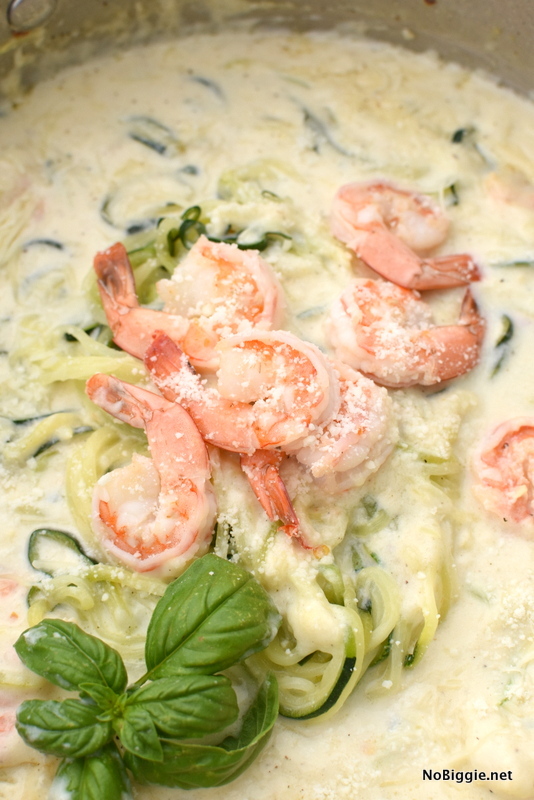 For the sauce for the zucchini noodles, we are making this Alfredo Sauce recipe. It’s the best! 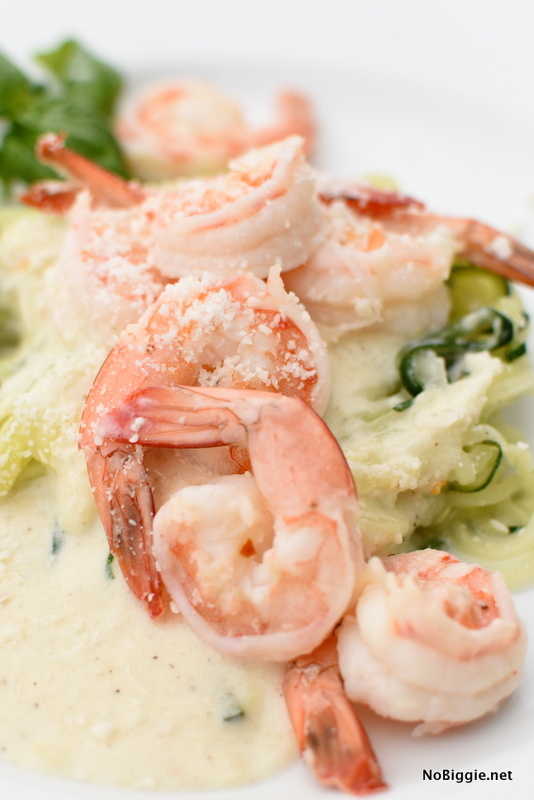 We made a quick video so you can see this dish come together. Just one pan or one pot. 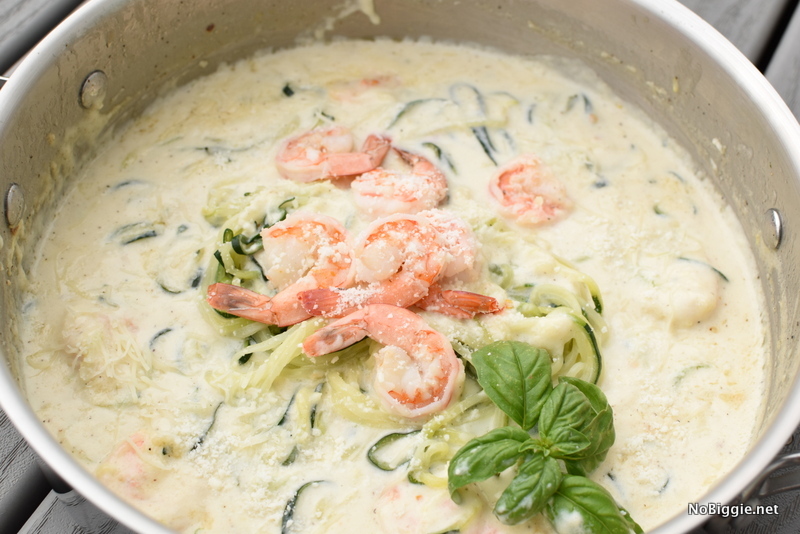 One Pot Creamy Shrimp with zucchini noodles. We love this low carb dinner! 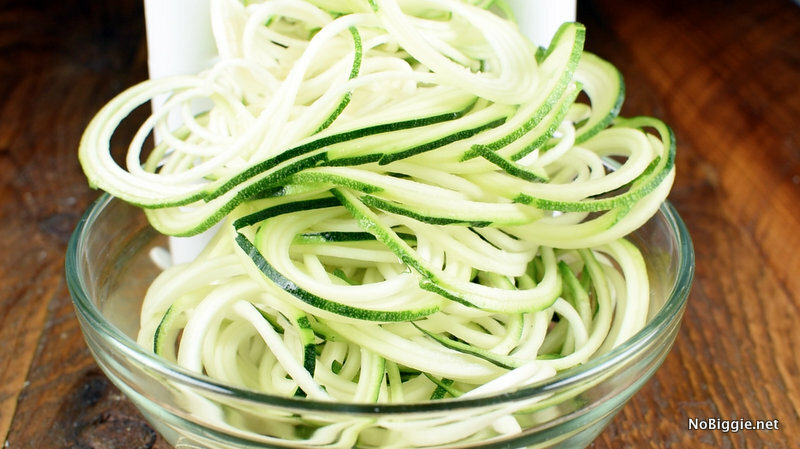 With a vegetable spiralizer, spiralize the zucchini into noodles (“zoodles” as we like to call them), set aside in a bowl. In a large rimmed sauté pan set to medium high heat add 4 oz. butter. Add 1/2 teaspoon minced garlic and red pepper flakes. Cook until fragrant. Add the peeled and deveined shrimp (leave the tails on) to the hot pan. 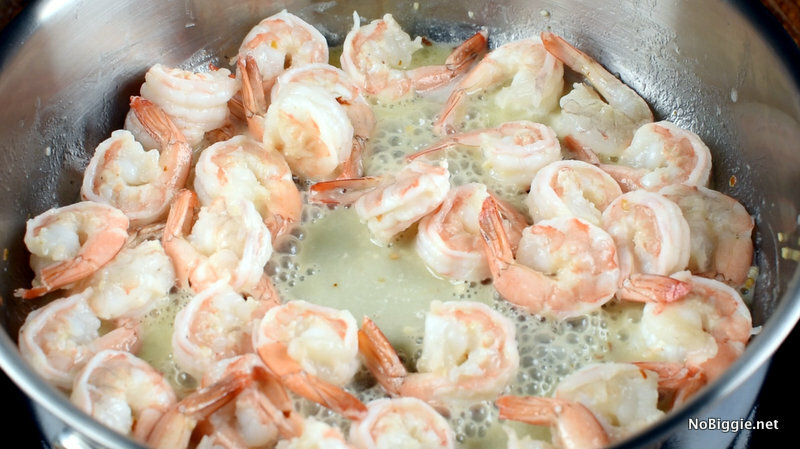 Cook tossing in the garlic butter mixture until all the shrimp turns pink. Move shrimp to a bowl and set aside. Add the zucchini noodles into the hot pan. Toss until well coated in the garlic butter mixture. Add in half a cup of water to help steam the zucchini noodles until cooked. When cooked remove zucchini noodles, set aside. Remove any excess water from the pan. Start to make the Alfredo Sauce: combine butter, garlic, heavy cream, milk, cream cheese, salt and pepper over medium heat. Bring to a simmer and then remove from heat and stir in the parmesan cheese. Temper the egg yolk before adding into the sauce by adding a little sauce with the egg yolk and mixing it with the sauce. Add the egg yolk into the sauce, whisking constantly to prevent the eggs from scrambling. If the mixture is too thick, add more milk if needed. Stir in cooked zucchini noodles and gently toss to combine; season with salt and pepper, to taste. Serve with sautéed shrimp for a complete meal. Enjoy!